Above is a hanging sign made for a Gems and Minerals Company/Store. The sign is made from High Density Urethane which has been lightly sandblasted to achieve a sandstone texture. 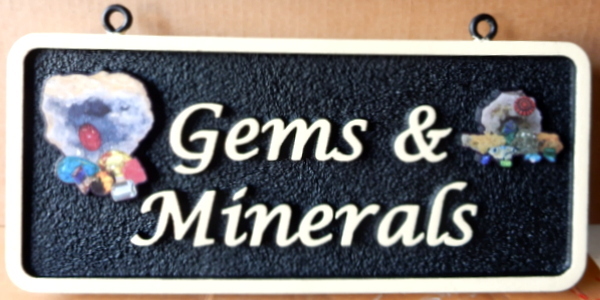 This sign features 2.5-D carved (raised, flat) images of mineral rocks and stones with colorful gems. The text and borders of the sign are also 2.5-D carved. After painting with bright long-lasting automotive-type enamels, this plaque is clear-coated twice, ready for indoor or outdoor use. This sign can be mounted on a wall, displayed in a window, or hung from a ceiling beam or wrought iron scroll bracket.